Artificial Intelligence (also known as Machine Intelligence) is intelligence demonstrated by machines, in contrast to the natural intelligence displayed by humans, like you and me. Why should I consider A.I. a career choice? Since 2015, the demand for Artificial Intelligence work has more than doubled over the past 3 years according to Indeed’s Hiring Lab. 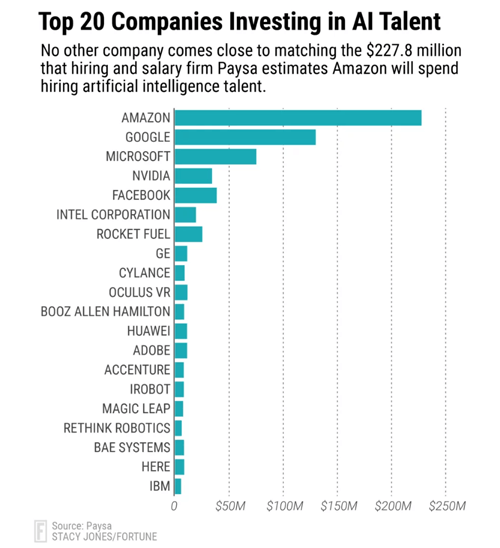 And then there’s the graphic below with findings from Paysa; a firm that uses millions of data points such as job openings, resumes, and compensation to help determine today’s market value of individual skills. One of the top companies investing in AI is BAE Systems – check out a recent prototype below of their Armed Robotic Combat Vehicle designed to be operated remotely from another military vehicle or qualified personnel on the ground. Carnegie Mellon University’s School of Computer Science has recently started offering an undergraduate degree in Artificial Intelligence. The goal is to train individuals to become specialists in AI and equip them with in-depth knowledge on how to transform large amounts of data into actionable and focused decisions. Currently, the U.S. News and World Report rank the SCS as the top graduate school for artificial intelligence. The bachelor’s degree program focuses on complex inputs, such as vision, language, and huge databases, are used to make decisions. Supplementary courses in subjects like statistics and probability, computational modeling, machine learning, and symbolic computation are taught as well. The Artificial Intelligence course at Stanford University gives you the opportunity to get up close and personal with professors who are pioneers of the AI revolution like Andrew Ng. Pick up advanced skills in the principles and technologies that underlie AI including logic, knowledge representation, probabilistic models, and machine learning. You can specialize in a few areas that include courses in robotics, vision, and natural language processing. This program is apt for software engineers with an aptitude for artificial intelligence as you need knowledge of various subjects including statistics and probability, linear algebra and calculus. Programming experience in Java, C++, Python or similar languages is also required. The Computer Science department was founded in 1973. It offers a comprehensive introduction to Artificial Intelligence through topics such as automated planning, cognitive modeling, commonsense reasoning, evolutionary computation, game theory, machine learning, multi-agent systems, natural language processing, and neural computation. Researchers too are involved with diverse subjects like Programming Languages, Augmented and Virtual Reality, Human-Computer Interaction, Computer Vision, etc. The program currently supports a very dynamic program of research and education, which is why it ranks high when it comes to external national assessments. Former students have gone on to very high levels of achievement in AI and associated fields. Massachusetts Institute of Technology or MIT has one of the top programs in Machine Learning & Artificial Intelligence. They offer excellent courses to empower individuals and businesses with the right education and training to rise to the peak of success in AI-related fields. The Professional Certificate Program includes the latest advancements and technical approaches in artificial intelligence technologies such as natural language processing, predictive analytics, deep learning, and algorithmic methods. The certification is awarded after completing four qualifying Short Programs courses. These courses must be taken within 36 months, and you have to apply with a non-refundable fee of $325. The four courses have to be paid per the course rate. The Institute for Creative Technologies dates back to 1999. It has one of the most lucrative research programs that include graphics, virtual reality, and artificial intelligence. The Institute works closely with the Information Sciences Institute and the Department of Computer Science located within the School of Engineering. They have a Virtual Care Clinic that essentially combines the healthcare and AI fields, by providing a unique opportunity to patients to receive world-class medical treatment without having to physically visit the clinic. AI research is also aimed at targeting social problems on a global scale. The Center for Artificial Intelligence in Society, Center for Cyber-Physical Systems and the Internet of Things, and Institute for Robotics and Intelligent Systems are involved as well. The Berkeley Artificial Intelligence Research (BAIR) Lab strives to bring innovative minds in the field of AI together. It has an undergraduate and graduate program with courses like Artificial Intelligence, Machine Learning, Probability and Random Processes, Statistical Learning Theory, Optimization for Modern Data Analysis, Computer Vision, Convex Optimization Advanced Robotics, Optimization for Large Scale Data Analysis, Algorithmic Human-Robot Interaction and much more. With over two dozen faculty and several hundred students pursuing research on fundamental advances in the courses mentioned above, as cross-cutting themes including multi-modal deep learning, human-compatible AI, and connecting AI with other scientific disciplines and the humanities. Computer Science at the University of Pennsylvania can be traced back to the study of engineering in 1850. In 1979, the College of Engineering and Applied Science eventually became the School of Engineering and Applied Science that manages the department of Computer Science and Information. Facilities specific to the studies of Artificial Intelligence include a wide range of subjects such as General Robotics, Automation, Sensing and Perception Lab and the Penn Research in Machine Learning group. Students earn a BA from the College of Arts and Sciences in Linguistics, Mathematics, Philosophy, or Psychology and BSE or a BAS in computer science from the School of Engineering and Applied Science. Students may apply through the freshman application or as internal transfers, space permitting. The inter-college graduate program for Computer Science and Engineering of the University of Washington goes back to 1967. The Artificial Intelligence research department comes under this program. Areas focused on are Automated Planning and Control, Intelligent Interaction, and Brain-Computer Interfaces and Computational Neuroscience. The department is active in several fields such as machine learning, natural language processing, probabilistic reasoning, machine reading, and intelligent user interfaces. They have also collaborated with the Allen Institute for Artificial Intelligence. Faculty members include Sham Kakade who is also a Washington Research Foundation Data Science Chair, and Rajesh Rao, author of the new textbook “Brain-Computer Interfacing: An Introduction”, and director of the Neural Systems Laboratory. Columbia University is perhaps the only educational institute to offer a MicroMasters program in Artificial Intelligence. It is conducted through the Fu Foundation School of Engineering and Applied Science, in partnership with the non-profit online learning organization edX. There are four graduate-level courses under this program – Artificial Intelligence, Machine Learning, Robotics, and Computer Animation. Whatever coursework is covered makes up for 25% of the coursework toward a Master’s degree in Computer Science. The Computer Science department offers AI related courses as well like NLP and Speech, Vision and Robotics, and Machine Learning. Ai related research is being conducted in al almost all areas. Home to one of the oldest Computer Science departments in the country, Cornell University has expanded with leaps and bounds within the last few decades. Research groups for Artificial Intelligence are concentrating on Computational sustainability, Game and decision theory, Knowledge representation and reasoning, Machine learning, Natural language processing, Robotics, and Vision. Cornell University has certainly been at the forefront of work in AI for years. The collaborative nature of the work done at Cornell Engineering that students will find novel approaches and applications for AI across all engineering domains, and build a successful career in this field. The College of Computing at Georgia Tech is divided into three schools and offers 18 degree programs. It is home to the Institute for Robotics and Intelligent Machines that was founded back in 2013. With over 30 robotics laboratories and 1,000 publications, the institute is in the midst of cutting-edge, innovative research. The subjects include Control, AI and Cognition, Interaction, and Perception. The objective is to build top-to-bottom and bottom-to-top models of human-level intelligence, while creating systems for intelligent tutoring, making systems that understand human behavior, building autonomous agents that can adapt in dynamic environments and so on. The University of California has been making amazing breakthroughs on modern AI, while they focus on developing technologies that will completely change the way people interact with the world. One of their AI research programs includes the MUSE Project, which is responsible for teaching computers to write stories about King Arthur and his knights of the round table. Another Artificial Intelligence endeavor is the Mentor Project, which uses AI to study advice giving. Research labs include the Bio-cybernetics Laboratory, Automated Reasoning Group, Laboratory for Embedded Collaborative Systems, Wireless Networking Group, and the Internet Research Laboratory. The study of computers goes back to the year 1946 at this university. The department of Computer Science offers 70 majors with 7 degree programs. The Artificial Intelligence Laboratory was inaugurated in 1991 – the main focus was to find out techniques for applying AI methodologies to real-world issues. Research projects include Data Mining for Manufacturing and Design Processes, Biological Motif Modeling, and Automating the Evolution of Linguistic Competence in Artificial Agents. Other facilities investigating subjects and areas specific to Artificial Intelligence research include Beckman Institute, Natural Language Processing group, and Speech and Language Engineering group. The John A. Paulson School of Engineering and Applied Sciences at Harvard University is well-known for its Artificial Intelligence courses. The study of Computer Science is available to undergraduates through doctoral candidates. As students, you get the opportunity to interact with the Harvard College Engineering Society to take cross-disciplinary research a step further. In Computer Science, Artificial Intelligence and subsets of Computational Linguistics, Machine Learning, Multi-agent Systems, and Robotics, are extensively researched by various faculty members. The Future Society at Harvard’s Kennedy School founded The AI Initiative, yet another center devoted to AI research. The department of Computing and Mathematical Sciences at Caltech is under the Engineering and Applied Science division. It is situated in the Annenberg Center for Information Science and Technology. Both undergraduate and graduate courses are offered here. Programs related to AI include the Center for Autonomous Systems and Technologies, Institute for Quantum Information and Matter, Lee Center for Advanced Networking, and of course, the Rigorous Systems Research Group. Through the Center for Autonomous Systems and Technologies, students will be able to focus on using AI extensively in areas such as Advanced Drone Research, Autonomous Explorers, and Robots in Medicine. The Computer Science and Engineering program was founded by computing pioneers Arthur Burks and Gordon Peterson in 1957. The Artificial Intelligence Laboratory comes under this program. There is a multidisciplinary group of researchers who conduct theoretical, experimental and applied investigations of intelligent systems. At present, subjects include rational decision making, distributed systems of multiple agents, machine learning, reinforcement learning, cognitive modeling, game theory, natural language processing, machine perception, healthcare computing, and robotics. The research here is generally interdisciplinary and structured on elements from computer science, linguistics, psychology, economics, biology, controls, statistics, and philosophy. In pursuing this approach, laboratory faculty and students work closely with colleagues throughout the University. The Computer Sciences Department at the University of Wisconsin – Madison has 3 major areas of focus that cover topics like computer vision, machine learning, and biomedical informatics. Themes in computer vision include active approaches for medical image analysis, face recognition, and image-based modeling and rendering. Machine learning research focuses on both logical and statistical approaches. Biomedical informatics is all about design and analysis of novel algorithms for knowledge transfer in reinforcement learning, active learning for sequence models, combining logical and probabilistic representations of knowledge and multiple-instance learning. Courses offered include Medical Image Analysis, Advanced Natural Language Processing, and Computational Cognitive Science. Artificial Intelligence research is advancing at a rapid rate – researchers are working hard to equip machines with abilities to solve problems that require high-level expertise, perform complex tasks autonomously, learn from experience, interact and collaborate seamlessly with people, and cope effectively with uncertainty and missing information. Research is conducted across 9 research centers and laboratories here – the Cybersecurity Institute, Center for Intelligent Information Retrieval, Advanced Computer Networking Research Group, Architecture and Language Implementation Group, Knowledge Discovery Laboratory, Laboratory for Perceptual Robotics, and Theoretical Computer Science Group. Current subjects of research include automated planning, autonomous systems, computational neuroscience and bio-computation, computer vision, heuristic search, intelligent tutoring systems, knowledge discovery and data mining, machine learning, and much more.